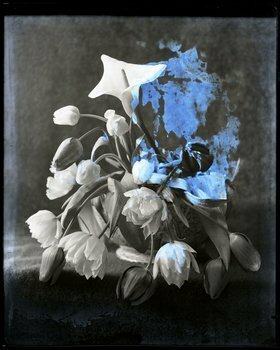 Jodie Carey, Elegy IV, 2012, Digital print from glass plate negative c.1920, (Framed) 37 x 40 cm. Jodie Carey works in a wide range of media, exploring ideas of time, memory and materiality, of time passing, memories fading, of absence and loss and ultimately the fragility and vulnerability of human life. Her brand new works, commissioned and created especially for this exhibition, include a large-scale sculptural installation, with large plaster works meticulously coloured by hand, and another work suspended from the ceiling which has been hand-crocheted by the artist using thread that has been coloured using dyes created from individual flowers. Solomon's Knot is the name of the stitch used to make this work. As well as being a term deeply rooted in decorative traditions, it also has wide-ranging meanings for different cultures, often related to wisdom, knowledge and immortality as it has no end and no beginning. It is also called the Lover's Knot as the knot can be interpreted as entwined figures.